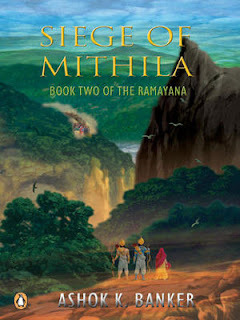 The ‘Siege of Mithila’, like ‘Chandrakanta’, seemed to be excessive at all times. Banker seems to have gone on an overdrive with the second part, in words and their content, making it the second fattest book of the series with 522 pages. There’s so much happening on every page, it’s almost vulgar. Even the writing is so adjective-ridden, that one sentence feels like a mouth so stuffed you cannot chew or swallow. Sample this:Around noon, they had left behind the rolling grassy plains where wild horses, elephant and rhino roamed freely and entire clans of lumbering hippopotami rolled cumbrously in mud pools, and the path had begun undulating constantly, seemingly unable to stay flat any longer, while thickets of wildbrush, sage, bamboo and bizarre profusions of multi-hued wildflowers bounded on either side. My editor hands have wanted to slash in half almost every sentence in this book. There might be readers who appreciate this style of writing and call it giving attention to detail, but I find it onerous. Why, even the first mention of the ‘Siege’ part of the ‘Siege of Mithila’ happens after 300 pages! :D :D :D That's an absolutely impressive review. God! That sentence had me irritated, how did you manage to read the entire 552 pages of that?! I know, sometimes, writes go overboard in order to create a niche with their words. Tch Tch. I love your style of reviewing! :D Good Job!